I am extremely picky about who colors my hair so needless to say when our schedule and my colorist schedule did not line up and I was 6 weeks overdue on a coloring I was in panic mode. Do I entrust my hair to someone else or just have some massive roots and washed out color. Well I went with the latter but really did not like how my hair worked. 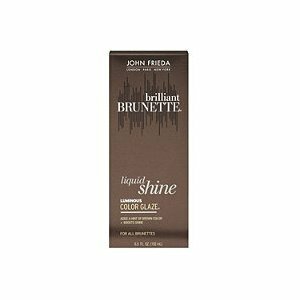 I was at the drug store and I saw that John Frieda had a color glaze. Usually a glaze comes in clear and it adds a lot of shine to your hair. You can get this done at a salon but they also sell at home kits that are really easy to apply yourself. This color glaze was a bit different because first it had a hint of color to it and second you did not apply it just one time like a typical glaze but you use it up to three times a week in the shower after you shampoo and condition your hair. I purchased this product for __. I have smelled other glazes like this before an was turned off by their smell. This product however has a very nice scent and when it comes out of the bottle it is a dark brown with a gold shimmer to it. I applied it to my wet hair starting at my roots and going down to the tips. I promptly washed my hands because they had the same look as when you put on sunless tanner and then left the glaze on for 5 minutes. When I blow-dried my hair I was pleasantly surprised to see that my hair had a nice shine to it and that my color had a lot of dimension. It really seemed to amplify my highlights and lowlights. Also I was happy that my hair was not heavy or greasy as it sometimes gets with new products. It really looked great and the results do get better with each use! Bottom Line: When your color starts to get blah use this for a little boost!